Working with words is such an important part of our curriculum. 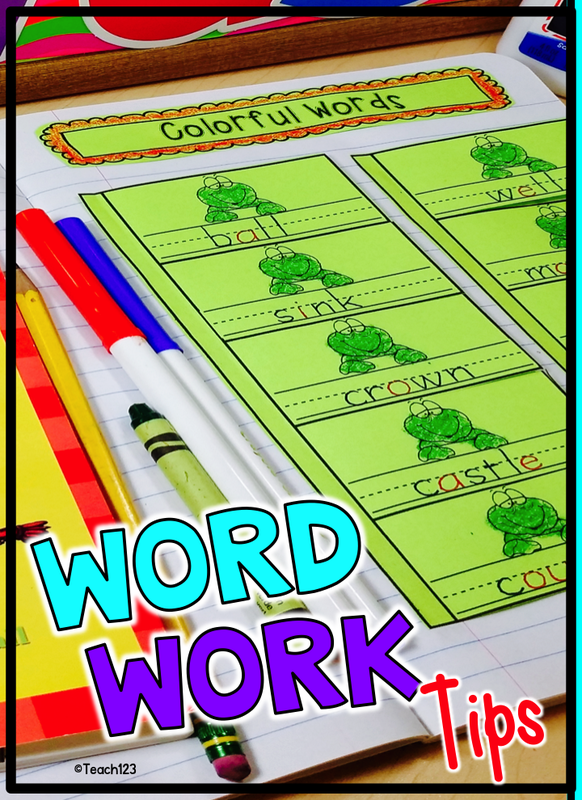 I am always looking for new ways to make planning quicker and easier for word work lessons. Ask any teacher what one of the top 5 stresses of his or her job is and you will hear, meeting the needs of a wide variety of ability levels. 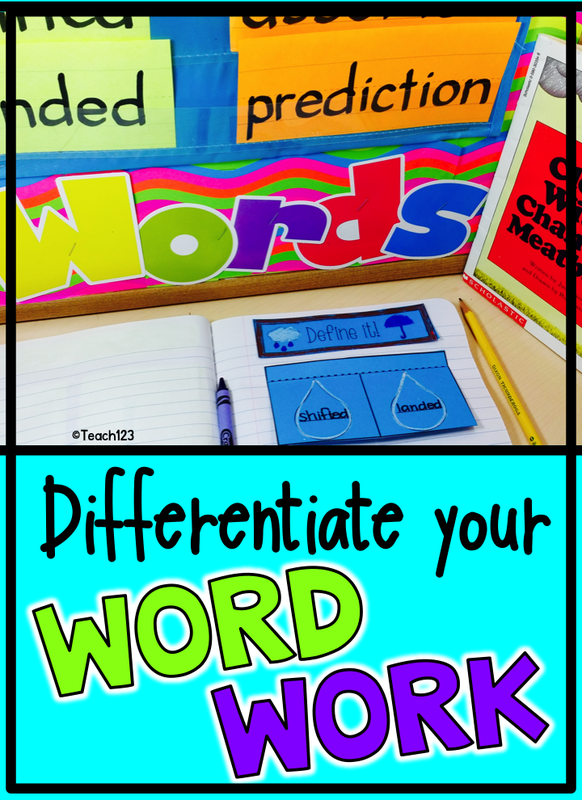 There is a quick and easy way to differentiate your word work center. In the picture above is a word work center for the story, Cloudy with a Chance of Meatballs. Did you notice that there are vocabulary words written on different colored sentence strips? Each ability group is assigned a color of vocabulary word cards. The class can study the same book, yet focus on different words from the book on their ability level. On that top 5 list of stressors for teachers is usually not enough time to teach what I need to teach. Each year it seems like our schedule gets more and more hectic. Yet the expectations of what we are supposed to accomplish with less time doesn’t change. So, what is a teacher supposed to do? I found that integration is what helped me the most. The more I was able to integrate my subjects with each other, the more time I seemed to “find” in my day. I found that integrating helped my students, especially my struggling students and the ones who were less-than-enthusiastic about school. In the picture above is an example of integrating science and language arts. 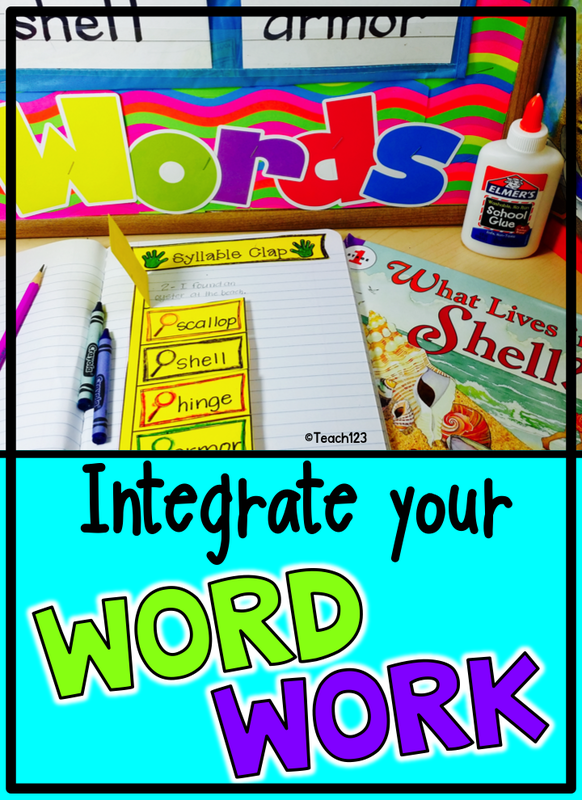 It is a quick and easy word work center to set up. Write the science vocabulary cards on sentence strips. Put them in a small pocket chart. Target Dollar Spot has great pocket charts at Back to School time for $1. Integrate your current grammar skills with your science vocabulary. In the picture, students counted the syllables and wrote a sentence with the word. This is from my Working with Words: Interactive Printable packet.